Picture this: you’re about 1 week into your diet. You’ve prepped all of your meals. You’ve stuck to the plan. You feel SO GOOD. Nothing in the world can stop you now! But then, your BFF calls you in need of a girls’ night out for dinner and drinks. You can’t say no, but you don’t want to totally screw up your diet progress. Stress hits you like a ton of bricks. Sound familiar? We preach flexible dieting simply because there’s sustainability in being able to eat the foods that you enjoy eating. Sure, it’s great to eat more home-cooked meals and to prepare things on your own, but life is bound to happen at some point and you’re going to need to eat a meal out. It’s not uncommon to stress-out about this if your dieting history has always been restrictive, but the good news is there’s really no reason to stress because eating a meal out doesn’t mean your progress has to stall. Do your best to estimate your meal and macros. Leave that meal untracked, but save some calories to “cover” that meal. Both of these situations are going to help you be mindful when choosing your meal, which makes this different from what we know as a full-blown “cheat meal”. We no longer use that term ourselves or with our clients because it insinuates that you’re going off-plan, cheating on your diet, or doing something bad. Promoting negative behavior and emotions when it comes to food isn’t how we do things at SD Evolution so we’ll just call it an untracked meal. Choose your protein source first. Fish? Chicken? Steak? Chances are you’ll have a good amount of choices here. Load up on veggies. Carbs and fats are easy to come by when dining out. Especially since you aren’t sure how your foods are being prepared. Who knows what oils the chefs are using or if the food is actually fried. Veggies are a good way to help keep that “full” feeling while getting your micronutrients in at the same time. Save the starchy carbs for last or plan to indulge in some bread as an appetizer. Carbs are easy to come by so choose what you want to enjoy there. Maybe it’s the appetizer, Italian bread, an alcoholic drink or even a dessert. Opt for water or a low-calorie beverage if you plan on having a bigger meal or indulging in some way with food. Drinking your calories can be a sure-fire way to underestimate what you actually had. In situation 2, you have some more wiggle room. This is what we recommend most clients do (unless they’re deep in a fat loss phase or on a tight schedule with their goals). One meal isn’t going to completely mess up progress for you, especially if you’re mindful and use the guidelines above. We suggest saving anywhere from 400-1000 calories from your day to “cover” the meal you plan on having. 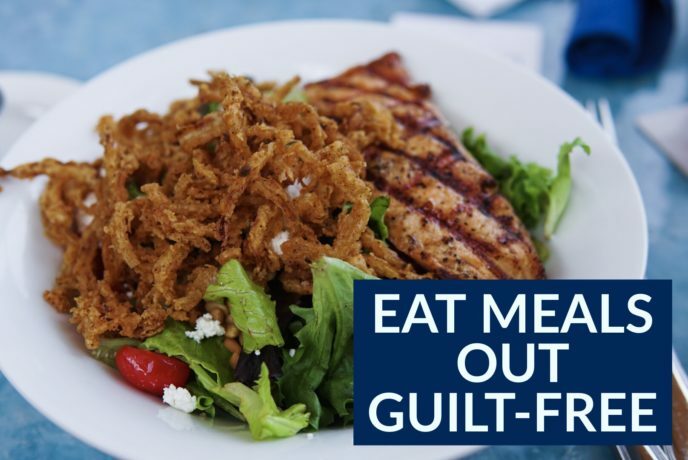 If it’s a larger meal (let’s say a burger and sweet potato fries) you’ll probably want to set aside more calories, but if you’re going out to dinner and plan on having just a salad with fish on top, you probably won’t need to set aside 1000 calories for that. Estimate, be smart and just pay attention to hunger cues. Stop eating when you’re full, don’t mindlessly pick on chips/appetizers while conversating and focus more on the company of whoever you’re with! It doesn’t always need to be ALL about food. So next time you’re stressing about going out to dinner in fear that your diet will be forever ruined, take a big breath and relax. Remind yourself that memories with your loved ones will always come before perfect macros and that one meal is not going to keep you from achieving your goals. Just get back to business the next meal, or day and you’ll be cruising right along!